Iceland’s northernmost town, Siglufjörður (which now is a part of Fjallabyggð, along with Ólafsfjörður), is a historic fishing town whose fame and fortune has always been linked to the ebb and flow of the fishing industry. A tiny shark fishing village in 1900, Siglufjörður soon became one of the largest towns in Iceland and the undisputed capital of herring fishing in the Atlantic. Although the herring have disappeared, the town bears the distinct imprint of ‘The Herring Era’. The harbour at Siglufjörður has long been considered one of the best in Iceland. As early as the Middle Ages, English and Dutch fishing and merchant ships favoured Siglufjörður as a convenient, sheltered base of operations. During the 20th Century, Siglufjörður became the centre of Iceland’s flourishing commercial herring fishing industry and its harbour one of the largest and most important in the country. 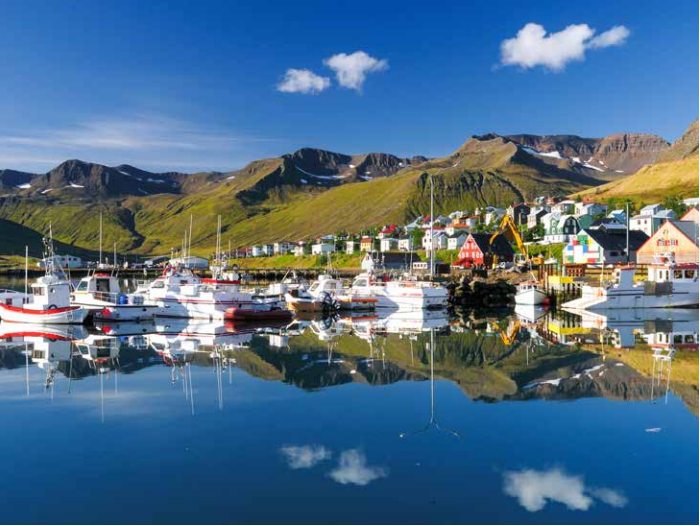 In the heyday of the herring fishery, Siglufjörður was a town filled with fish, jobs and money, a busy boomtown with a gold rush-like atmosphere that quickly earned the nicknames Klondike of the Atlantic, Fishermen’s Eldorado and Iceland’s Sodom. By mid-century, 500 boats were active in the local herring fishery. In times of bad weather, hundreds of fishing boats would seek refuge, tying to the docks or anchoring in the fjord to wait out the storm. There were so many docks in the harbour that you had to travel a kilometre and a half to get from the first one to the last. In fact, laid end-to-end Siglufjörður’s docks would have stretched well over six kilometres! With the disappearance of the herring from Iceland’s waters by 1970, the old wooden docks were replaced by permanent concrete. Though considerably smaller than in the past, the modern harbour is still just as protected and just as close to the fishing grounds as always. Today, the harbour is frequented by large shrimp trawlers and small cod-fishing boats delivering their catch to local processors. 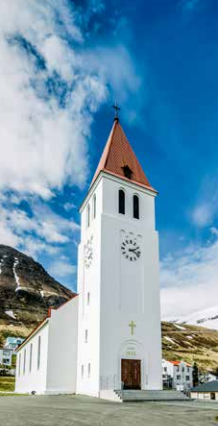 Since 2002 Siglufjörður has welcomed cruise ship passengers to visit this small town at the edge of North Iceland that is full of well kept history. Awarded maritime and industrial museum - where the ‘glory days’ of Iceland’s herring fisheries and industry are brought back to life in three different buildings. Róaldsbrakki, a 1907 salting station and bunkhouse. Grána, a 1930s-era fishmeal and oil factory. The Boathouse, recreating an example of the town’s thriving harbour of the 1950s with twelve old fishing boats at the dock. The Herring Era Museum was the winner of the Icelandic Museum Award in 2000 and won the European Museum Award in 2004, as Europe´s best industry and technology museum. This fascinating museum brings history to live for cruise passengers – offering the company of local herring girls as they gut and pack herring into barrels while shouting, gossiping, singing and flirting to recreate the long gone atmosphere of the herring years. They sing, dance and offer visitors to join in on a dockside ball where the accordion player attracts the right mood. Visitors can taste different types of herring on rye bread while washing it down with a shot of Icelandic Brennivín. Siglufjörður is an area of spectacular natural beauty. The mountains and the fjords are awe-inspiring and the opportunities for outdoor activities and recreation are almost inexhaustible. There are hiking trails for all levels of experience in the mountains and valleys surrounding Siglufjörður. The most popular trails lead into neighbouring Héðinsfjörður, an uninhabited fjord of pristine and natural beauty. The Folk Music Centre is located in Siglufjörður’s oldest house, the Madame House. The Centre presents Icelandic folk music in an accessible and entertaining manner through video recordings of people old and young, from all parts of Iceland, singing, chanting and playing traditional instruments. Visitors can take a crack at playing reproductions of an Icelandic fiddle and a langspil (a kind of bowed dulcimer), or just listen to the music while having coffee. Segull 67 is a small family owned craft brewery. The brewhouse is located in an old fish factory that has been designed and adapted to it‘s new role. 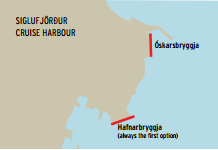 Segull 67 brewhouse is located within 300 meters from Siglufjörður‘s port. Up to 100 pax can go on brewing tours where visitors learn about this small family-run brewery as they get to explore the brewery itself „behind the scenes“ and taste their products.